Free access to KGS databases, online map services and GIS data, and publications. Displays KGS-hosted geologic map data in a web browser. With this web map service, you can quickly zoom and pan to view the geologic map for an area of interest, overlay and identify other KGS data (water, oil and gas wells, coal, etc), view a detailed legend, and query and access information about the geologic units. A mobile web application that can be used in a variety of supported mobile devices (iPhone, Android, Blackberry, etc..) and tablets (iPad, Galaxy Tablet, Kindle Fire, etc...) for displaying Geologic formations, oil and gas fields and wells, mapped sinkhole outlines, and other geologic information. Only a mobile web browser is needed to use this service (no "app" to download). Users will need data access to use this service. GPS capability will enable zooming to your location. Download an ESRI map package (from arcgis.com - for use in ESRI products such as ArcMap) of the 1:24,000 geologic map data for Kentucky. The data in the package is compatible with the GeoSciML portrayal view for geoscience data. 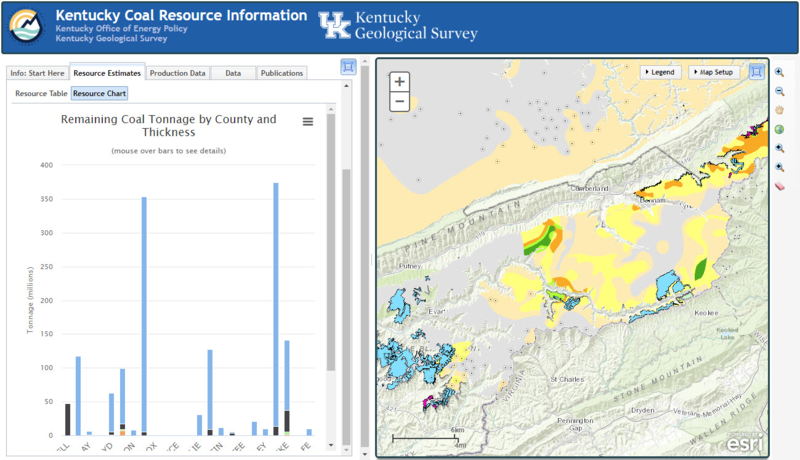 The source of the data is the Kentucky Geological Survey map database and consists of mapped geologic units throughout Kentucky. These "DVGQ" data (described in detail here) were digitized as a part of a project supported by the USGS National Cooperative Geologic Mapping Program from 1996-2006 to digitize all 707 USGS 7.5-minute geologic quadrangles of Kentucky into vector format, and compile these data into 1:100,000 scale map sheets. These data are the same detailed geologic map data displayed on the geologic map service. Detailed instructions on how to access KGS data for use in desktop GIS software without having to locally download GIS datasets. A directory of available services is also provided. The Kentucky Geological Survey and other state and federal agencies have electronic maps and GIS data that you can download for your use. The KGS GIS data are in ArcView shapefiles (registered by ESRI). The files were zipped using the WinZip utility. All the KGS datasets, unless explicitly noted, are in latitude and longitude, decimal degrees, NAD 83. The Kentucky Geological Survey is developing geologically-oriented story maps about locations around the Commonwealth. Explore these maps through this gallery. A tool is also provided to help you create your own ESRI story map from KGS images. This webpage provides a map showing location, information, and photos (if available) for some, but not all, of the natural arches that KGS geologists have visited and photographed, and are located on public lands and are accessed by a defined trail. KGS hosts several services that allow you to view and query water well and spring data, karst potential information, and groundwater water quality data. The water well/spring and groundwater quality data are also searchable through the groundwater information database search service. Use the map services below to view and query oil and gas well data, coal information, minerals information, and core and sample data. Much of the data displayed on these map services can also be found (and downloaded) through the oil and gas database, coal database, and samples and core library database search services. These two services were developed with support from the Kentucky Department for Energy Development and Independence, and allow users to view the Energy Infrastructure in Kentucky on an interactive map (Energy Infrastructure map), and to view and query information about existing coal resources in Kentucky (KY Coal Resource Information). Search for KGS publications, published maps, and map data. Many publications and maps are viewable online for free through this service. Use these services to search for and view KY oil and gas data including oil and gas well records and oil and gas production data. These services can be used to find various types of KY groundwater data including water well and spring records and groundwater quality data. Click here for information about changes to the Groundwater Data Repository database. 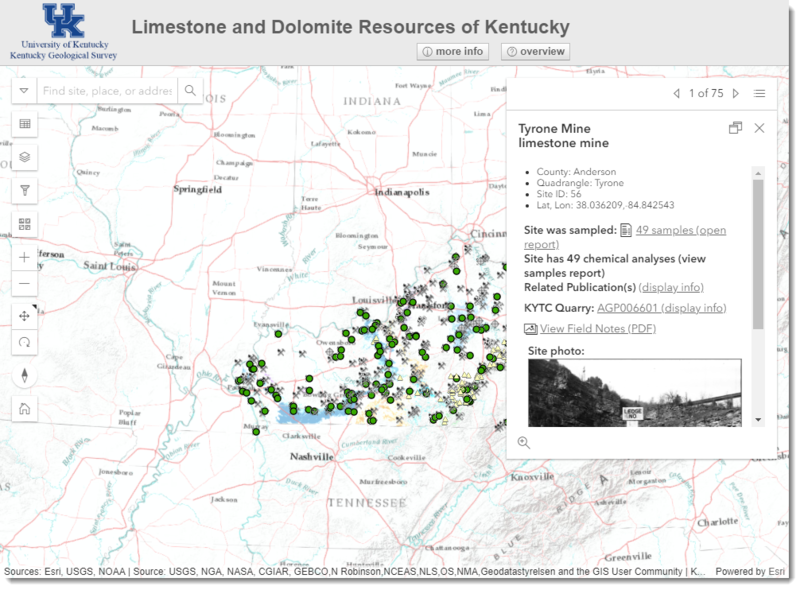 Use these services to search for coal data in both the eastern and western Kentucky coal fields. Data includes borehole (including lithologic and seam data), thickness, production, and quality. This service allows you to search the KGS well sample and core library database. Use a wide-range of criteria to search for and view images in the KGS photo catalog. Many of these images were taken by KGS staff and include information about the location (including a map link) and a description of the image. Search the entire KGS database for geologic descriptions (lithologic, economic, hydrologic, etc...) descriptions from KGS publications, maps, and field notes. The Kentucky Transportation Cabinet and the Kentucky Geological Survey have partnered to provide the results of geotechnical investigations to the public. Search geotechnical reports, geotechnical boreholes, and view geotechnical data on an interactive map. Listed below are various tutorials and presentations on using the KGS Maps and Database services. Added as they become available. If you have an idea/request for a tutorial, please contact us via the feedback form.